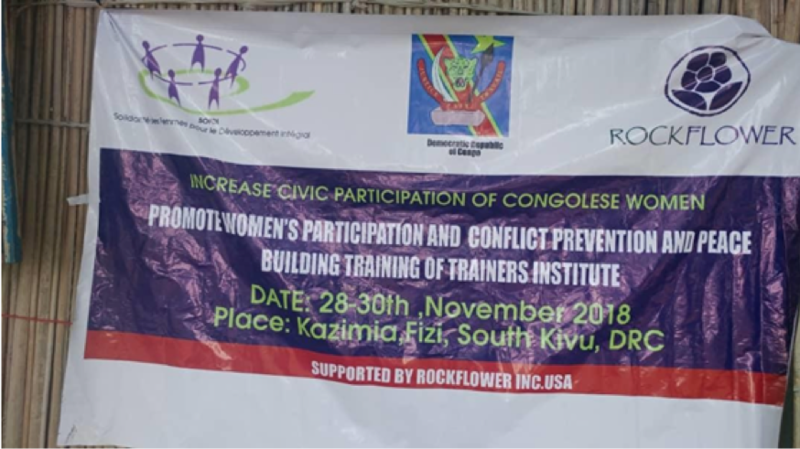 Solidarité des Femmes pour le Développement Intégral (SOFEDI) works to bring peace and security to the women of the Democratic Republic of Congo. Their goals are to assist women in playing a pivotal role in the peace-building process and be able to seek accountability for gender-related crimes in their transitional justice systems. The first day covered multiple themes, such as the effects that conflict has on women, peace negotiation skills, conflict management and the roles of local women in demobilization and reconciliation efforts. While the program is information based, practical activities, group discussions and videos were planned for those who cannot read and write (female literacy rates are less than 40% in the rural areas of the DRC). The second day focused on conflict attitudes and management. For example, attitudes toward conflict are: turtle (tendency to avoid), shark (tendency to compete), teddy bear (tendency to give way), fox (looking for compromise), and owl (tendency to collaborate). Each have their advantages and disadvantages and for the women to understand their dominant styles helps in handling conflict situations and adapting accordingly. The last day was led by Atuu Sincere, sociologist and director of Sauver la Femme et la Fille du Katanga (SAFEKA), and focused on the notion of leadership. The main activity of the day was the Training of Trainers Workshop. It builds the knowledge, skills and attitudes of the participating local women leaders to enable them to participate in peace-building in the areas ravaged by ongoing conflicts.